Hello, I'm just starting to learn the basic concepts in electronics and I was wondering if I was understanding these concepts correctly. Below is a simple LED circuit (in series) with my calculations at given points added in. I'm wondering if someone here could verify my calculations and perhaps explain to me how to calculate the last two values (denoted by "--")? I think if you were to measure the resistance from the top box to ground without power to the circuit it would be much higher than 1286 ohms (top box). The diode is a semi-conductor device and should have very high resistance when measured alone. To figure the circuit out, the diode drops (say) 2V and is not dependent on current (unless it is over driven). So you go from 9V to 7V. With the 1K resistor next, it has to drop that 7v to ground so V=IR or 7 = I*1000 or I = 0.007A. That is the amps for the entire circuit since it is a series circuit. So the bottom box I=0.007 and R=0 since it is shows no resistance to ground. My calculations were based solely off Ohm's law and the properties of circuits (current same in series, voltage in parallel), which is where the numbers came from. The first resistance was calculated based on R = V / I (from V=I*R), does this law not hold true here or is it my misinterpretation? It may seem odd to some that I'm calculating these properties at certain points instead of "over" individual components but this way seems clearer to me. I'm also not sure if the context I'm using voltage in is correct? (due to voltage = potential difference). Finally from a math perspective does your final answer (V=0V, I=0.007A, R=0ohm) have a problem in relation to Ohm's law? For instance, if I were to calculate I = V / R (I = 0 / 0) would it be correct that that the result is undefined? You hit upon it with the term "potential difference". 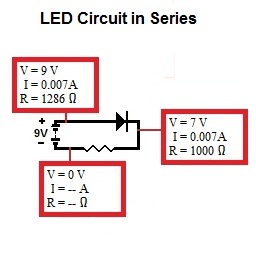 You can certainly pick any point and measure the voltage, but it has to be compared with some other point in your circuit (usually ground or the lowest voltage point). In that case any point can have a voltage value. With current the situation is different. Here you can just pick any point and measure how much current is passing through that point. Resistance is like voltage, it needs to be measured between two points to have meaning. The reason Ohm's law doesn't apply here is because of the diode. For example, if you used an 18v power source, the "total resistance" as you compute it would change...something that can't happen in a normal resistor-only circuit. (I think Ohm's law still applies to the bottom box V = I*R or 0 = 0.007 * 0). So the problem with these calculations is that this circuit is not an "Ohmic circuit"? Just doing a quick Wikipedia search for diode it appears as though diode's don't obey Ohm's law (they're above the law). So to ensure an accurate calculation at any given point is they're a way to accurately predict the behavior of a diode? You may have to do a two-step iteration for some LED's, but for many diodes it is as easy as just figuring the voltage on one side of the diode is 2 volts higher than the other side (in our case). So the resistor 'sees' a 7 volt supply instead of 9 volt. At that point you can use Ohm's law to get current. I mentioned the LED because the voltage drop across it does vary with currrent, but only slightly. First you estimate the voltage drop across the diode (say 2v), calculate the current, then check the actual voltage drop from the LED data sheet at that current level. Re-calculate current from the new voltage drop and it should be very close to the actual value. I think I understand the gist of what you are saying. There's a lot more variables to take into account then simply Ohm's law. Don't let the LED confuse you; it is still just using Ohm's law, because the diode is always going to drop the same voltage at a given intensity. Its easy to get hung when you add new components, but you just have to try and keep looking at this like a basic DC circuit. Everything in the circuit has a voltage drop, and the sum of all of the drops subtracted from the supply will equal zero. The LED is no different. So your bottom box is basically at ground level.